My Wey of Life: Last day of Jap Class? 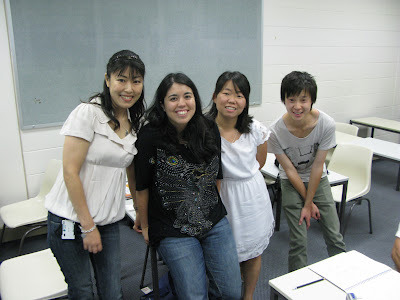 It's the last day of the term for Japanese class today. 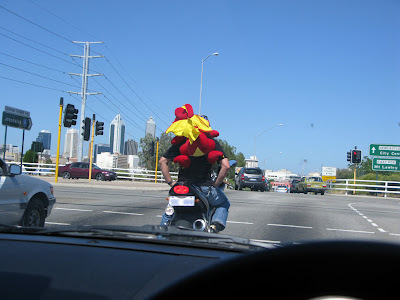 Drove to Tafe in the bright sunny day accompanied by this man carrying a big softtoy dinosour at his back. 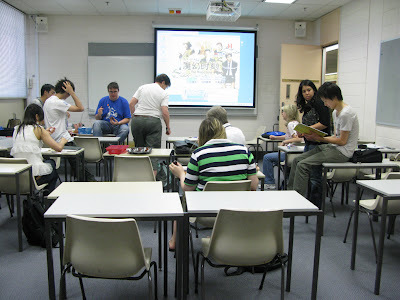 Got into the classroom, took a quick test (failed last week) and hang around in the class while waiting others to come. 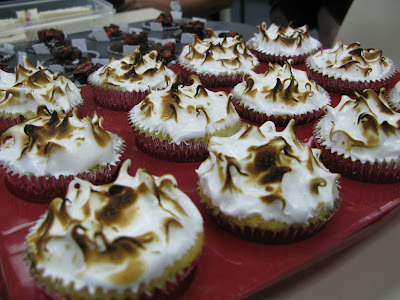 Kylie was very nice, she brought in some cupcakes that she made in the middle of the night. Poor Kylie. and the Chocolate Cherry cupcake. This was nice too!! 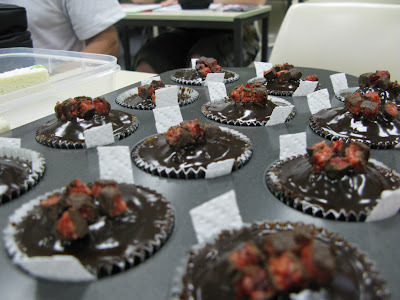 not very sweet and THICK CHOCO! I like! This is us waiting to watch the Japanese movie called "The Magic Hour". It's quite funny and catchy too! watch it if you can. This is the usual 3 of us, Kylie, Kien and I with Junko Sensei. She is a very nice sensei. Joke and smile everytime I see her, never see her angry face before! How did she do it? 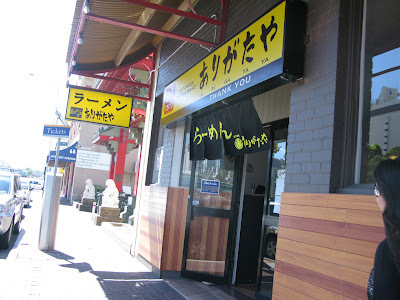 Kylie and I went to this new place in northbridge that sell ramen on railway parade. Menu has limited choices. We were a bit lost while looking at the menu. it's poorly design. 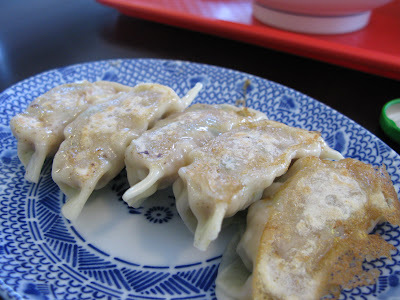 The gyoza was awesome though. Very meaty taste. love meat. 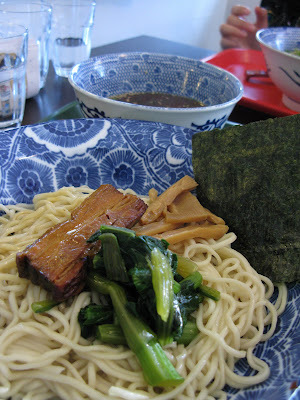 I had the Dipping ramen. It was nice. Homemade ramen too. if you are a big eater, you can huv extra noodle for free! Kylie had the Teriyaki ramen. Kylie hates eggs. she never had boiled, fried, poached or scramble eggs. As long as it doesn't taste the egg, she is fine with it. 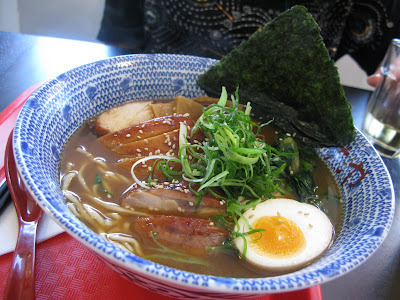 Unfortunately, the ramen that they serve got a STRONG eggy smell. She couldn't take it at all after a few spoon. So I change mine with her hope that mine is not that bad. But she still can taste it. She didn't manage to finish hers and so did I. Maybe because I had 2 cupcakes before that :P I guess Kylie will never go there again. haha..